Your skin is under extra duress during the hot months of summer, but it doesn’t have to be. By treating one of the biggest organs of detox from the inside-out with three must-have Ayurvedic herbs, you can support glowing, radiant, clear skin, even when pores clog from excess sweat. 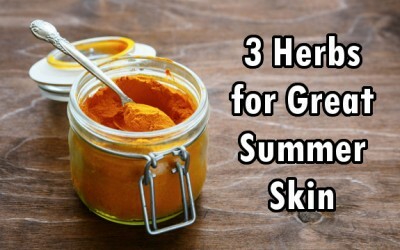 These can be used both externally and internally, so stock your herb pantry for great summer skin. You may already have heard that turmeric, also known as haldi, can cure multiple forms of disease, from cancer to arthritis. But did you know that it is also a great summer-time skin treatment, known as a super beauty product in much of Asia and India? It is even applied in India as a paste to the bride and groom’s skin pre-wedding night to make it lavishly smooth and clear. To brighten your skin on a hot day, try mixing turmeric powder and rice powder with raw milk and tomato juice, enough to form a paste, and apply it to your face and neck for 30 minutes. Rinse with lukewarm water. You’ll end up with clear, glowing, refreshed skin. This is also a great remedy for slight sunburn. Here are some other turmeric uses to consider. Also known as Chandan, sandalwood is one of Ayurvedic medicine’s best acne remedies. It also treats scrapes and rashes, as well as under-eye circles and dark skin pigmentations. When used in a paste, it can have a cooling property for agitated skin, and it definitely brightens up tired-looking skin with over-worked sebaceous glands. Sandalwood has antibiotic and anti-bacterial qualities, too, which will should protect the skin from blemishes caused by bacteria. When you mix sandalwood with turmeric, the results are compounded. Make a sandalwood-turmeric paste by mixing 1 tbsp of sandalwood powder with ½ tbsp. of turmeric powder. You can mix it with about ¼ teaspoon of honey or raw milk. Apply a coat of this paste on your face and let it sit for about 20 minutes. The best part – sandalwood smells amazing! Not only has Ayurvedic medicine turned to aloe, but so have the Polynesians. The Egyptians called it the ‘plant of immortality’ and the Native Americans call aloe ‘the wand of heaven.’ This super-plant has been known to heal all sorts of skin conditions, and it soothes sunburns like nobody’s business. Of course the health benefits of aloe vera don’t stop there – check it out. Having at least half a dozen different organic antiseptics, aloe can also destroy fungus, bacteria, and viruses, while being a potential treatment for AIDS. You can use it on bug-bites, to treat acne, to soothe itching, dry skin, or to minimize damage from frostbite. It helps with pimples, psoriasis, eczema, can be used as a homemade burn anecdote, and helps to restore youthful skin. Able to reduce hyper-pigmentation, or dark spots, aloe is also one of the most soothing herbal plants you can use in a massage. It can even be used as a shampoo or hair rinse to help with hair growth. Aloe vera is one of the best remedies for great skin – and a hundred other health concerns. Incorporate these three herbs into your summer health regime in order to beat the summer heat, and look great doing it.